This BestHD Blu-Ray to MPEG Converter can help you share Blu-Ray on more devices, like Apple TV, PS3, ARCHOS 7. 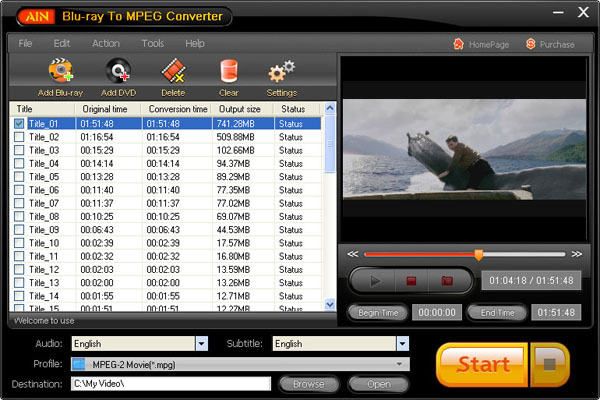 Convert Blu-ray and general DVD to MPEG formats, as MPEG-1, MPEG-2, VCD?? ?MPEG2 PS, HD MPEG-2,HD MPEG-2 TS. There is a small Free Blu-ray player built in Blu-ray to MPEG converter and so you set start-time and end-time just when you Watching the Blu-ray Moive. BestHD Blu ray To MPEG Converter can rip blu ray movies to video formats compatible with Apple TV, PS3, ARCHOS 7. This blu-ray converter can rip blu-ray movies to most HD/SD formats:it supports MPEG-1, MPEG-2, VCD£¬MPEG2 PS, HD MPEG-2,HD MPEG-2 TS. You can save the image which you like at any time during the playing process . WinAVI 3GP MP4 PSP iPod Video Converter - Can convert almost all video formats, for e.g., DivX, XviD, MOV, Rm, Rmvb, MPEG, VOB, DVD, WMV, AVI to portable video device Apple iPod Video, Sony PSP, MP4 Player, smart phone etc.